If the only thing that gets you through a long day of work is drowning your sorrows at quitting time, this enabling timepiece is the watch for you. 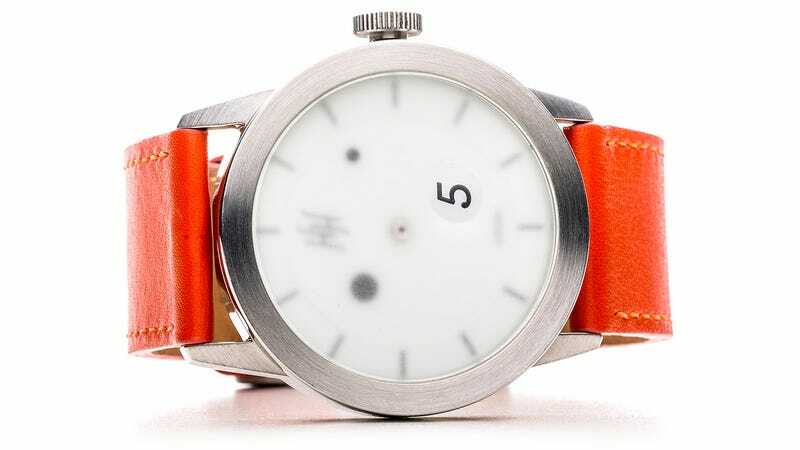 Five o'clock is the only hour that's clearly labeled, as far as the Ish watch is concerned the rest of the day is a fuzzy blur. But if you squint hard enough, you can make out the two moving dots that make up the watch's hour and minute hands. That's not the only reason the Ish could be the alcoholic's best friend, though. In addition to its focus on telling time in relation to when you could and should be drinking, the Ish features a clasp that does double duty as a bottle opener. Which, by itself, could be the greatest innovation in watch making since the quartz crystal.